Coral is one of the most recognisable and well-regarded brands in the world, therefore prospective players of Coral’s online casino probably have enough confidence and trust in the product already when it comes to fair gameplay, safety and security. The Ladbrokes Coral Group (owned GVC Holdings) is a London-based betting and gambling company, owning hundreds of Gala, Ladbrokes and Coral shops across the nation. 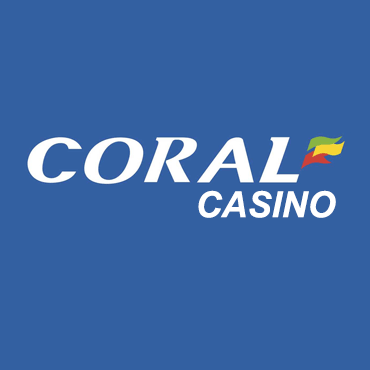 Branching out into the online casino industry over a decade ago, Coral offers customers a huge range of online slots, casino games and betting products. With its distinguishable blue backdrop, bold white typeface and colourful motif, Coral is hugely familiar. The company has developed quite a simplistic, “no-frills” type website which is easy to navigate and allows simple access to the all-important business areas: Sports, slots, casino, VIP, etc. Coral offers a good all-round games package, with the slots collection being the most impressive. Perhaps the casino games availability could be broadened somewhat, but there is enough to keep the regular gamer entertained. The welcome bonus package is exciting and Coral ticks all the boxes in terms of customer support and payment options. Coral boasts a total of 245 games, including slots, table games and a few popular scratch cards. The games are predominantly online casino slots, with many offered by well-respected and superior software developers such as Playtech and Microgaming. Themes are varied and gamers can choose to play 3 reel slots, 5 reel slots, classics, feature-packed and much more. Any slots fans will undoubtedly feel spoiled for choice. Some of the new titles include Blazin Hot 7’s, Solar Disc and The Goonies – based on the cult 80’s adventure comedy, of course. See what’s sparking the interest of fellow gamers and check out some of the most popular games right now at Coral, including the Irish-themed Rainbow Riches: Reels of Gold, Buffalo Blitz and Fortunes of Sparta. Those huge jackpots are just waiting to be claimed; for these have a go at Wish Upon A Jackpot King, Slots o’ Gold or The Pig Wizard. Furthermore, Coral also has exclusive slots, so if you like to try out slots that aren’t widely found across the web, have a spin on Chilli Fiesta, Voyage of Adventure of El Torero. There are 14 table games for casino lovers to take a seat at too; Blackjack, Roulette, Casino Hold ‘Em, Baccarat and Jacks or Better are all available to participate it. Perhaps you’d like to take it live and join the live casino for a round of Roulette, Blackjack or Baccarat too. Finally, there is a mini but decent collection of scratch cards; these include Merlin’s Millions Scratch and Iron Man 2 Scratch. Check out the Bingo section for a whole new world of bingo fun too; at Coral there is certainly something for all. Players have a broad range of options when it comes to financial transactions at Coral, each offering a strong level of security. Pay by mobile, Visa, Mastercard or Maestro; alternatively you can bypass providing personal details and use PayPal. If e-wallets are your preferred method, use Skrill or Neteller. Coral also accepts Connect. Eco and PaySafeCard payments. In addition to a magnificent list of payment options, withdrawals are super simple and best of all, the minimum withdrawal amount is just £0.01. There is also no maximum withdrawal threshold. The process usually takes between 2 and five days. If you’re considering registering with Coral Casino, perhaps their generous welcome offer will help you decide. The package consists of a £30 bundle when you deposit and wager at least £10 on a qualifying online slot or casino game. It’s useful to note that a third of this welcome bonus comes with wagering requirements; that’s the £10 casino bonus which carries a 24x wagering requirement. The free spins and golden chips bonuses carry no requirements. Newbies can also grab a free £10 bonus for Big Banker online slot. Select Opt-In when you register, and the £10 bonus will be credited to your account in the first 72 hours of membership. Beyond the golden hello, Coral offers promotions regularly including free spins, bonuses and more to suit the long-standing members and freshers alike. Be sure to check out the latest Super Jackpots too; these are new progressive jackpot slots that together offer a huge Super Jackpot every day. This jackpot is guaranteed to pay out by 9 pm every day, making somebody a very lucky winner. Coral also recognises and appreciates every moment of your time as a loyal member, therefore for every £10 deposited and wagered, you will earn Comp Points (Coral’s loyalty points scheme). Of course, the more you stake, the more you earn. Comp Points can later be exchanged for cash. Additionally, players can climb the VIP ranks with their valued loyalty. The higher the level, the better the benefits, including a personalised account manager, a tailored priority programme, better bonuses and rewards, super quick withdrawals, bespoke hospitality invitations and more. Coral offers first class customer service starting with 24 hours a day, seven days a week availability. The first point of contact for any query could be the comprehensive FAQ section, whereby it is easy to search for and locate answers to specific questions and topics. Failing that, the support team are always on hand to assist further. Use the live chat for instant messaging, email, the freephone telephone number or even contact them via the Coral Twitter page (the handle is helpfully provided on the Help webpage). It is becoming much more widespread to use social media for company contacts and we really rate this modern method of customer communication. Coral is, like any other modern casino, playable on all devices and systems across mobile, tablet and desktop. Not all games are available to play by mobile, but there is a handy mobile icon next to the games that are fully mobile optimised. The site displays quite a basic design; after all, only the brand logo is needed to attract an abundance of attention. The interface is very easy to use, fast-loading and no download is required. This is the perfect online casino to play on the go.